The Slate Flash is a moderately rare species in Singapore that can be found in parks and gardens as well as in the forested nature reserves. It is a fast flyer and can be skittish at times. The upperside of the Slate Flash, which belongs to the varuna group of the genus Rapala, is a shade of blue or green. It is a closely allied species to the Indigo Flash that was featured last week. The brown underside features narrow post-discal bands that are darker than the ground colour of the wings. There are a pair of typical Rapala white tipped filamentous tails at vein 2 of the hindwing and the tornal area of the underside of the hindwing features light blue scales. 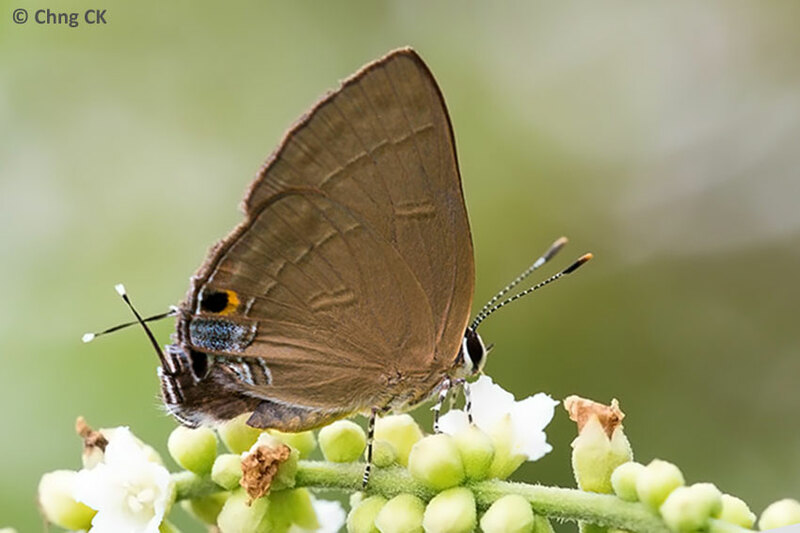 This Slate Flash feeding on the flower of the String Bush was shot by ButterflyCircle member Chng CK.